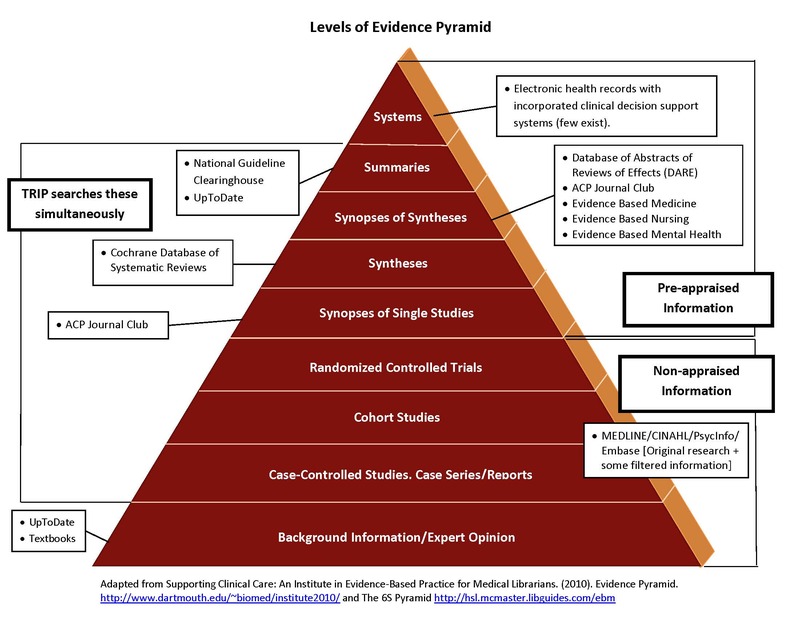 For a larger version of the pyramid, please see this PDF. See the Study Types tab for definitions and other information. The American College of Physicians’ editorial staff review individual articles. Part of Wiley's Evidence Based Medicine Reviews collection, a joint production of the National Library of Medicine (NLM) who produce MEDLINE and Reed Elsevier who produce EMBASE. Contributors follow quality control standards to ensure only reports of definite randomized controlled trials or controlled clinical trials are included. CDSR is the leading resource for systematic reviews in health care. Includes Cochrane Reviews (the systematic reviews) and protocols for Cochrane Reviews as well as editorials. The CDSR also has occasional supplements. High-quality, independent evidence to inform healthcare decision-making. It includes evidence from Cochrane and other systematic reviews, clinical trials, and more. Log in via CAS popup window to start each session. Critical assessments of systematic reviews from medical journals. As of April 2015, DARE is no longer being updated, The Cochrane Library will host the archived versions. Biomedical and pharmacological articles and conference proceedings. Evidence-Based Medicine systematically searches a wide range of international medical journals applying strict criteria for the validity of research. Content is critically appraised then the most clinically relevant articles are summarised into an expert commentary focusing on the papers clinical applicability. EBM also publishes articles relevant to the study and practice of evidence-based medicine; including Original Research and Reviews. Evidence-Based Mental Health aims to engage psychiatrists and psychologists, particularly younger professionals, in the challenge of basing their practice on evidence. Published by the Royal College of Psychiatrists, the British Psychological Society and BMJ the journal surveys a wide range of international medical journals, applying strict criteria for the quality and validity of research. Clinicians assess the relevance of the best studies and the key details of these essential articles are presented in a succinct, informative expert commentary on their clinical application. Evidence-Based Mental Health also publishes Editorials, Perspectives, Reviews and Original Content. Published quarterly, the purpose of Evidence-Based Nursing is to select from the health related literature research studies and reviews that report important advances relevant to best nursing practice. The clinical relevance and rigour of the studies is assessed to identify research that is relevant to nursing. A commentary on chosen articles identifies the key findings and implications for clinical practice. Content is commissioned only. Evidence-Based Nursing is co-owned by RCNi and BMJ under the editorship of Dr Alison Twycross from London South Bank University, London, UK. The National Guideline Clearinghouse is a public comprehensive database of evidence-based clinical practice guidelines and related documents. It is an initiative of the Agency for Healthcare Research and Quality (AHRQ), U.S. Department of Health and Human Services. Evidence-based information about complementary and alternative therapies. Validated rating scales are used to evaluate the quality of available evidence. Monographs undergo blinded editorial and peer review prior to inclusion. MEDLINE via Ovid is available through this link. Index to articles covering all aspects of medicine. Developed by the National Center for Biotechnology Information (NCBI). Clinical Queries is designed to locate articles in PubMed with higher levels of evidence. TRIP (Turning Research into Practice) locates the highest possible evidence with which to inform clinical decisions, using the principles of evidence based medicine.